We manufacture a gamut of Cement Crusher to our clients. These crushers help in easy soaking of the husks by crushing and punching these. Owing to the specific features of these crushers, the fibers in the husks become soft and straight for easy processing. For relatively reducing the soaking time of the husks, the crushers are used to hasten the process. We are well-known manufacturers, exporters, and suppliers of an array of industrial products and offer to our clients the Roll Crusher. 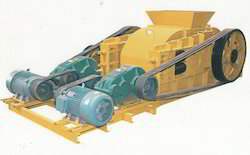 Roll crushers are designed for heavy duty, long life service and require minimum maintenance. We provide a range of double roll crushers, automatic packaging machine, packaging equipment, product packaging equipment etc. Our products are made using fine quality raw material and state-of-the-art technology. At all levels of production the quality is maintained and vouched for by our team of professionals. Looking for Cement Crusher ?